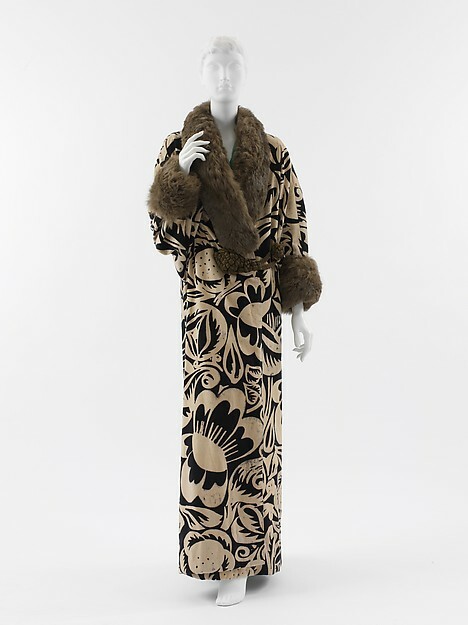 Paul Poiret was born into a house of modest means in Paris, France, in 1879. From the time he was a youngster, he had a large opinion of himself. So much so, that according to Bowles, his parents apprenticed him to an umbrella maker, hoping this would rid him of his natural pride. He used left over scraps of silk to make clothes for a doll one of his sisters gave to him. The seeds of a fashion revolution are sown. Women’s fashions of his youth featured structured silhouettes that required corsets, layers of undergarments, and often padding. But, it seems that the seeds sown in the apprenticeship of the umbrella maker may have inspired his radical approach to fashion design. As a teen, he sold his sketches to major Parisian couture houses and was hired by Jacques Doucet in 1896. Bowles tells us that his first design for Doucet, a red cloth cape, sold 400 copies. He moved to the House of Worth, where he designed simple practical dresses. But, his designs proved to be too controversial for Worth’s clientele. Poiret opened his own fashion house in 1903. His first creations were controversial, in that they were designed for the uncorseted, slim figure. He credited his wife as being his model and his muse. He grabbed that controversy and turned it into a marketing coupe. Flamboyant window displays and sensational parties were thrown to draw attention to his work. The 1910 Ballets Russes production of Scheherazade in Paris spurred the popularity of Orientalism. Poiret, already designing for uncorseted figures, was one of the first designers to capitalize on the trend. Times were changing, and fashion seemed to be leading the way. Around the same time, the first true fashion shows were being produced. In 1911, Poiret’s fashions were part of a dare between publisher, Lucien Vogel and photographer, Edward Steichen. Vogel dared Steichen to promote fashion as a fine art. What resulted, according to Niven, was the first modern fashion photography shoot. The photos were backlit and shot at inventive angles, marking the first time garments were treated as works of art. Poirot also opened a home décor design arm of his company and also developed and marketed perfume. After serving in World War I, Poirot returned to a much different attitude in France and a fashion house on the brink of bankruptcy. Newer, younger designers like Chanel were ready for the 1920s and the women who demanded sleek designs and excellent workmanship. Poiret designed his garments to be appreciated from afar and therefore lacked in quality workmanship. His designs did not keep up with the times and in 1929, the fashion house was closed. He died in poverty in 1944. His friend, Elsa Schiaparelli, paid for his burial. “Bowles, Hamish, “Fashioning the Century.” Vogue (May 2007): 236–250. Niven, Penelope (1997). Steichen: A Biography. New York: Clarkson Potter. p. 352.